Trying to avoid cold and flu in the workplace has reached desperate levels, as nearly half of people surveyed would give up a vacation day to a sick worker to ensure they don’t bring illness to the workplace, according to the seventh annual cold and flu season survey from Staples. Findings show that while the U.S. workforce is keenly aware of the dangers as well as prevention tactics surrounding seasonal illness, personal accountability remains low, with nearly 80 percent of employees still going to work sick. In fact, employees have a ready-made excuse when they get sick – it’s their coworkers’ fault. Nearly three-quarters (73 percent) of employees have caught a cold or the flu at work, and nearly one-third (32 percent) blame coworkers for getting sick last year. • Presenteeism vs. absenteeism: Two-thirds (67 percent) say an employee going into work sick, but not fully productive, is worse for a business than an employee who stays home and doesn’t work when sick; this represents a sharp increase from 31 percent of respondents who said the same in 2014. • Prevention also prevalent, particularly among managers: 47 percent of managers typically clean/sanitize their work-related equipment on a daily basis, compared with just 34 percent of all U.S. workers. • Nearly half (44 percent) of managers called in sick when they weren’t, in order to avoid sick coworkers, compared with 21 percent of all U.S. workers. • Awareness still strong: 58 percent know that cold and flu viruses can live on a surface for up to three days, slightly up from last year’s survey. 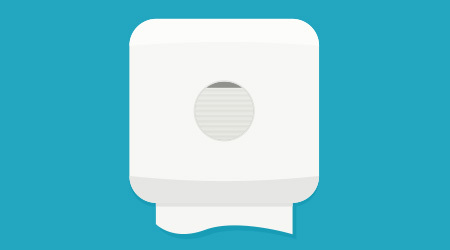 • Less than half (only 48 percent) of employees say their office provides disinfecting wipes to clean their work surfaces. To combat this, if employers aren’t providing these or other disinfectant products, 77 percent bring them to the workplace on their own. 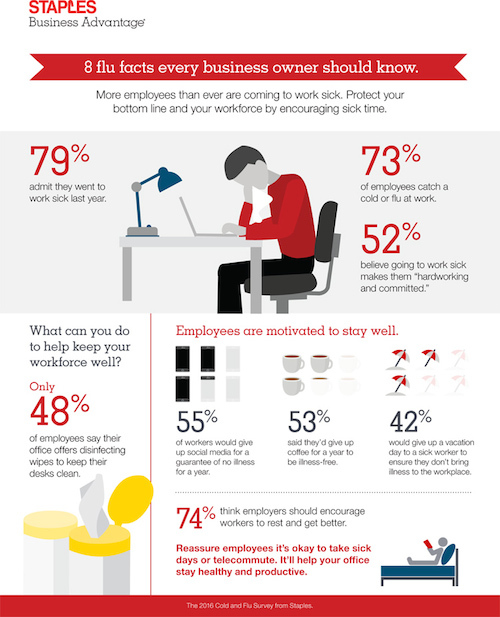 • Nearly two-thirds (61 percent) of workers think employers should offer office-wide flu shots. • Although most employers provide sick days, too many employees hesitate to use them when they should. Seventy-four percent think employers should encourage workers to rest and get better when they get sick. There is also still a need for personal accountability.